The National Shrine of St. Francis, 610 Vallejo Street at Columbus Avenue. 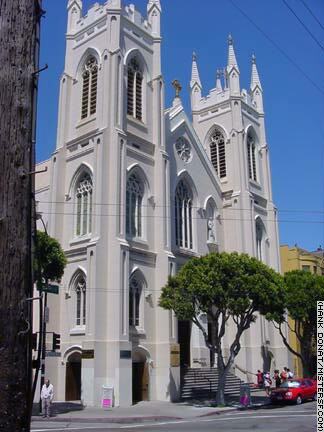 The church was built in 1859 and survived the 1906 Earthquake and Fire. Detail St. Francis is the City's most enduring icon. San Francisco is appropriately named for him, the patron saint of ecology and merchants. Francis of Assisi was born in 1182, the son of a wealthy textile merchant. He was blessed with charm and personality. His early life was punctuated by popularity and ease. He liked to party. When he left Assisi to fulfill his dream of becoming a knight, he was almost immediately visited upon by God, who told him turn back. To the people of the town it seemed that the golden boy had choked, chickened out, come home a coward. He was humiliated, derided by Assisi, and eventually disowned by his father. Francis turned to God. He would exalt the tenants of the Catholic Church in their purest form, but not in the fashion of a fundamentalist. He preached, and indeed lived, principals of sacrifice, grace, and love for all creatures of God. For this he is known as the lover of all creation. Famously, he preached to birds, which he saw as equals in the pantheon of creation. His sense of brotherhood knew no boundaries and his followers came from communities of the rich and poor alike. Impulsive because he shot from the heart, Francis' life as a wandering preacher was tumultuous. He advocated poverty and sought to convert a sultan, a Muslim, during the Fifth Crusade. Two years before his death in 1226 he received the stigmata. (Holes appeared in Francis' hands like those of Christ as he was nailed to the cross.) His final years were marked by illness and suffering. During this time Francis wrote about the glory of God, nature and the elements, even death and humility in his Canticle of the Sun. Francis of Assisi died at the age of 45. The National Shrine of St. Francis on Vallejo Street is the only St. Francis shrine outside of Assisi. The Peace Prayer of St. Francis (1915, author unknown) is a beautiful invocation and a mantra for San Francisco.